I'm not writing much today but I wanted to share this photo. Our mini- dachshund, Tilde, goes to a play group every Thursday. Since we live in an apartment, Tilde has few opportunities to play freely with other dogs. Our trainer picks Tilde up and takes her to different spots every week where she has a pack of friends. Every week, we receive a photo of the activity. 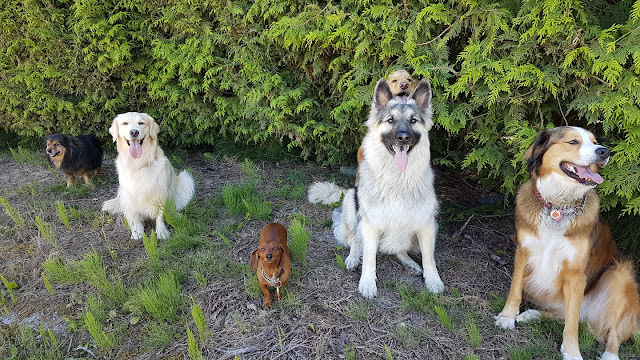 Our little dog, who is never still, posed with the pack. So funny! It's her class photo. I'm off to the day surgery this morning for my cataract surgery. I'll see everything more clearly and the world will be a brighter place. Happy week-end! In preparing for M's French lesson, I learned that no French person says "Happy Bastille Day" but I hope that France wins the World Cup. I was in Nice in 1998 when they won it. But Croatia is a small country and has never reached the finals so maybe they will win. Whoever wins, I'm sure that it will be a great game. So you're into day 3 post cataract surgery now? How are you doing? Of course, you're not likely even to be reading this online yet but I do hope that all goes well now. Your Tilde is darling, such a small little girl among all the big boys and girls. Her class photo is so cute although how they get them all to be still is a mystery to me. We watched the World Cup today, thought it was a good game. My vision is amazingly clear right now. I have refrained from reading too much although I have a great pile of library books. I can see a few cobwebs that I've missed before in my housekeeping so I've got a bit work ahead of me. The dog trainer is so talented with all the dogs. They want to do as she says. I think we spoil Tilde a bit because we got her at 7 weeks and she is such a loving little dog. The World Cup is always interesting. I was in France in 1998 when they won and the celebrations were amazing.